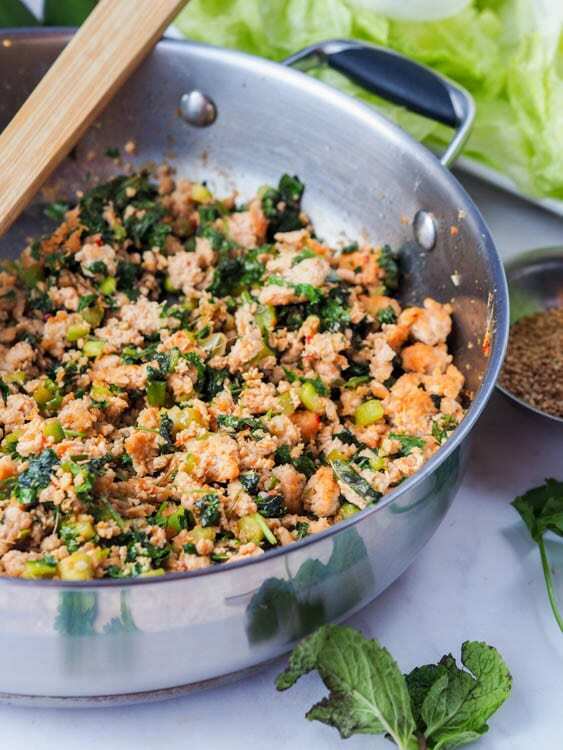 Have dinner on the table in 30 mins or less with these low carb high protein Asian chicken lettuce wraps which are brimming with vibrant flavors from the green onions, mint, cilantro and cucumbers. Bound to be your new favorite weeknight meal. Gluten-Free & Dairy Free. 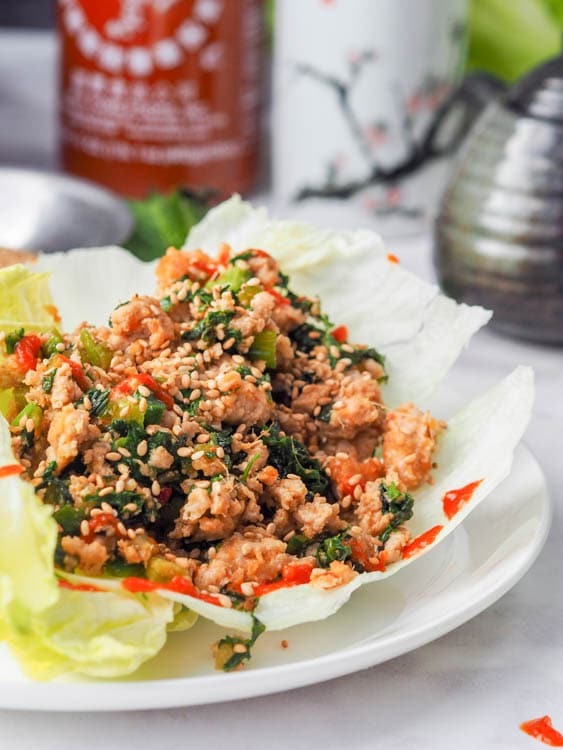 There are certain recipes I make all the time, and these Asian chicken lettuce wraps are one of them. I mean I have literally made this recipe half a dozen times in the last couple months and I’m only sharing it on the blog now. I know, it’s unforgivable that I’ve been keep these Asian chicken lettuce wraps all to myself. This perfect 30 minute low carb dinner recipe that is packed full of crisp and refreshing flavors, and I haven’t shared it with you. Honestly I can only blame the lack of daylight hours in a day. You see, I’m always making these Asian chicken lettuce wraps around dinner time, mostly when I’m in a hurry and already starving. And since it’s winter time and the sun decided it needs to set mid afternoon, I couldn’t possibly even attempt to try to butcher a proper photo of these delicious wraps by using artificial light. 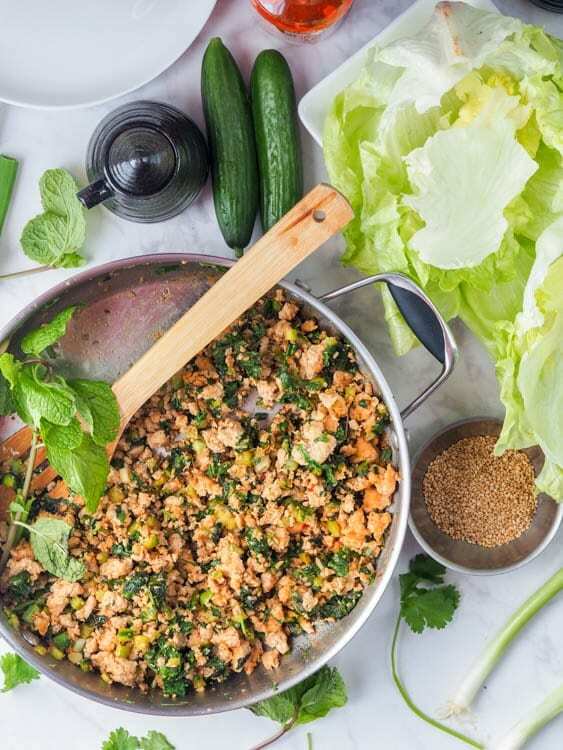 These lettuce wraps deserve the best — also know as natural light in the food photography world. I didn’t use to care about natural light at all, and now any time I enter an apartment we’ll be staying in on our travels I’m always scanning the kitchen and living room for natural light. It’s what all my food photos require. If you want to see what happens when I use artificial lighting (as in regular kitchen lights) scroll back to my 2011 posts and you’ll quickly see the difference. So in the winter time there’s always the daylight race that I’m a part of. This is mostly me trying to finish up all my recipes, plate them, and photograph them before the sun sets. You would think this should be easy. Yet somehow I always find myself starting to cook in the afternoon and then rushing, literally with minutes of daylight left, to get my photos taken. Anyone else out there force stressful situations onto themselves for no reason whatsoever? Tell me it’s not just me. It just seems my brain goes into hyper efficient mode when there’s a time crunch. Give me all the time in the world and I’ll never complete a task, give me a hard deadline and I can work like never before. Enough rambling, back to these Asian chicken lettuce wraps. As you already know I love love love Asian flavors. And quick meals. 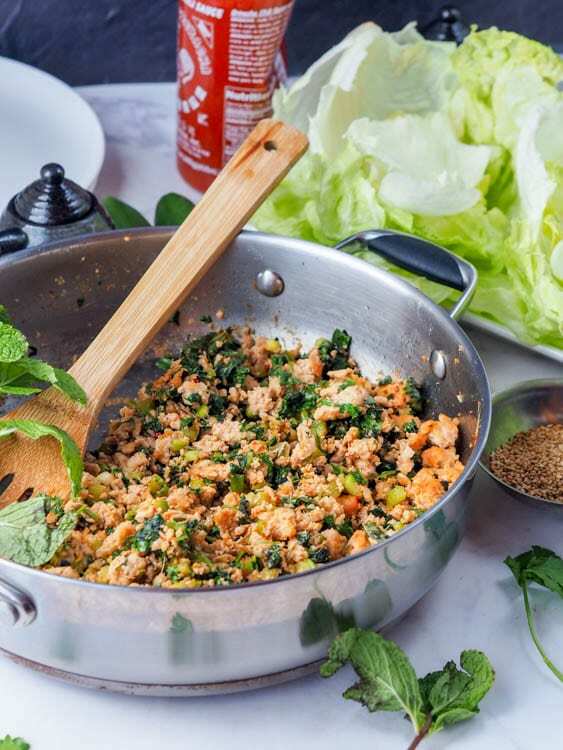 These lettuce wraps come together in under 30 minutes, and as the ground chicken is cooking you can prep all the other ingredients – garlic, ginger, cucumbers, mint, cilantro and green onions. This is perfect low carb high protein weeknight meal. 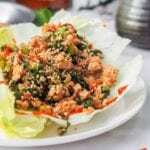 The mint and cilantro give this dish an awesome pop in flavors and the Asian style sauce (a mix of sesame oil, chili garlic sauce, tamari, etc) take these Asian chicken lettuce wraps to the next level. Everyone in my family loves these. 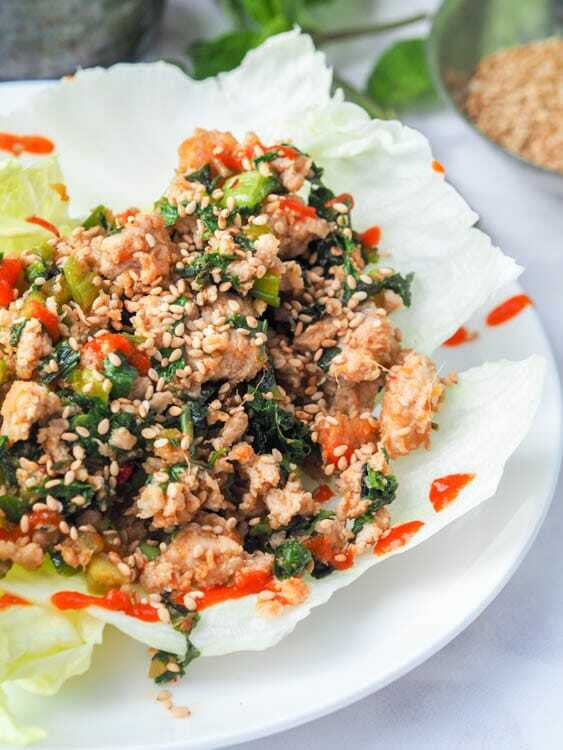 And if you’re not a fan of iceberg lettuce cups, this can be served over rice instead with the lettuce chopped up (making it quite similar to my Asian turkey stir fry). Normally I don’t even measure out any of these ingredients (but felt the need to this time around so I could write up a proper recipe), so if you’re comfortable in the kitchen no need to take out those measuring spoons and cups, you can just eye everything. This is a dish I have made so many times that I can confidently say that I know you’re going to love it too! Heat pan over medium heat and add oil. Add ground chicken and cook until cooked through (10 minutes or so), stirring frequently to break up the meat. To the chicken add minced ginger and garlic. Cook until fragrant, 1-2 minutes. Add cubed cucumbers, green onions, tamari, chili garlic sauce, sesame oil, rice vinegar and honey. Add cilantro and mint. Mix. Serve in iceberg lettuce cups, topped with sesame seeds and Sriracha. This is a favourite in our house. It’s a nice low carb option and a good way too use up leftovers too. Right?! Lettuce wraps are my favorite! These look fab! Big fan of making healthy swaps and lettuce wraps are genius! I am willing to bet I could eat that perfectly spiced chicken straight out of the pan! It sounds so delicious! I certainly just do that sometimes! These look so filling and flavourful!! Love how quick they are to throw together as well; I have no excuse not to make these ASAP! Yes they come together in no time at all!